Sometimes inspiration strikes at the most unlikely times. Like yesterday when it was hot and we did not have the air conditioning on yet! Once we got moving furniture, we closed up the house and turned the air on. The last two days have been 90 degrees! 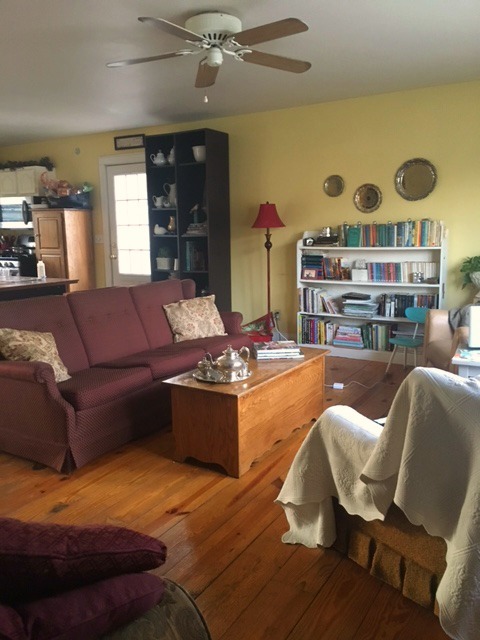 These two photos are of the living room before the rearrangement. I'd changed things out on the walls already but the basic furniture arrangement had been the same for quite some time. My idea began with an idea of moving a few things in my bedroom (which I'll show in a few days), and involved me moving somethings around in the living room. Now, with the red cabinet (you can read about it here) moved out from my bedroom - it used to be next to my side of the bed - and my great-grandmother's china hutch moved from beside the front door to the corner of the living room, the bookcase now feels like it belongs. I'm very happy with the arrangement here. But with the hutch in that corner, the chairs needed to switch spots with each other. It looks better visually, since the tan chair is taller. Since I moved the red cabinet to the living room, I moved my desk to the wall by my bed and it is acting as my bedside table now. That left a wall empty, so I moved the small white bookcase from the living room - it used to be next to the love seat - to the empty wall in my bedroom. I then moved a side table that matches the one between the chairs, to the space where the small bookcase had been. This looks better visually, too, since the bookcase fit right under my teacup holder and the lamp and anything else I put on top of the bookcase hid the tea cups. 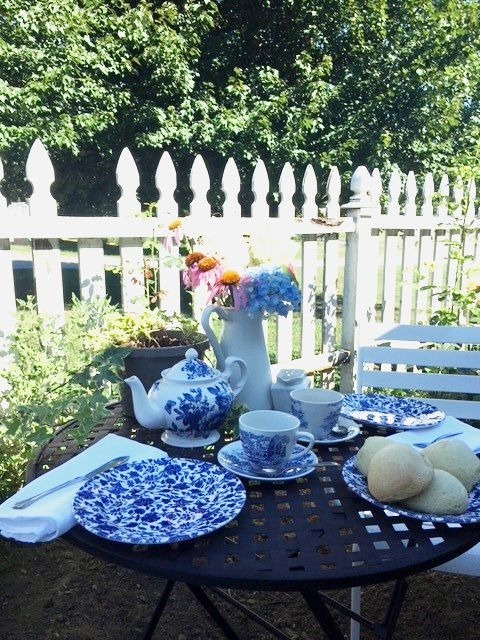 I have a great new spot to show off some peonies, too! With the hutch gone from beside the door, this has opened up this space and makes moving around to the closet easier. The closet is across from the front door. This closet houses our vacuum, broom, mop, etc, as well as winter coats. I put this ladder in that space for now. I think my favorite thing is how great this red cabinet looks in my living room! And the hutch in the corner. My fern loves its place on top of the hutch. It gets lots of light, but not direct light, and it is out of the way of little visiting hands. My poor fern got scalped one Sunday last year by a sweet little visitor. It nearly died and is finally recovering well! I'm pleased with how it looks. It looks very cozy and welcoming! You did a great job! Have a wonderful weekend and enjoy your living room! Such fun, isn't it? And I really like that child's turquoise chair there. I get inspired like that too--and then watch out. I like what you've done and agree with you on the red cabinet. A pop or red seems to help photos and louse arrangements too. And the white cabinet in the corner--perfect! Enjoy the new look and hope you cool down a bit there. 90 seems too hot for May. That's our temp here too but we're farther south. Still too hot for May. One thing always leads to another when furniture rearranging is in the works!! Love your "signature hutch" in the corner. Your space is so cheerful and cozy! Moving stuff around is my favorite way to redecorate! It looks great. Love that red cabinet.